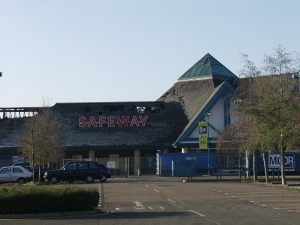 This was a very similar project to that at Taunton ie another fire damaged store. Mace were brought in as project managers and used a construction management contract rather than Design & Build as had been the case at Taunton, putting individual packages of work out to tender in an effort to reduce time & cost. Much time was spent on this project working directly with Safeway’s design department producing a new set of standard details which could be used on subsequent stores.